Is There Any Cash Shortage in the Country? Barrow’s CabinetReshuffle: Causalities, Survivorsand Reasons You Never Knew. The revelations coming out from the TRRC really are very horrible and one cannot believe that such can be done by our sons of the land. The manner of the killings are gruesome and very horrifying. Many of those who went under such painful maltreatments as they narrates are seen crying through the full view of our television screens. We therefore call for parallel radio and television programs to console and preach reconciliations. Like in our previous editorial, the truth is being gradually told and so to some extend the facts too are in the process of being established. Yes victims are really speaking out and venting out their venoms, and in some cases they reveal hardships that be felled them in the hands of the people we considered as our own. A witness told the Commission that all the killings at the Yundum barracks and Fajara barracks were done in the presence of the leadership of the Junta in the persons of Edward Sighateh, Sanna Sabally, Yankuba Touray and Sadibu Hydara on November 11, 1994. Another witness told us that captured soldiers on 11 November were butchered to death in the presence of the following who were the rulers then; Yunkuba Touray, Sanna Sabally, Edward Singhateh, Peter Singhateh, Sadibu Hydara, Momodou Badgie and Babucarr Jatta. Another witness also told us that Fafa Nyang was shot and the bullets of the gun shot at him was not able to penetrate or kill him; then he was later subjected to kicks and hits with gun butts in an effort to killing him; he was then pushed in ditch alive which was dug earlier and buried alive. Even when helpless Nyang was in the ditch Corporal Colley fired gun shots at him. 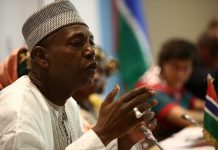 Another witness Dr Binneh Minteh, a former Lieutenant in the Gambian gendarmerie at the time of the coup, told the TRRC that Gibril Saye was cut into two pieces after he was killed by former junta member Edward Singhateh. Now that the revelations at the TRRC is making loved ones shed tears as they watch and listen to what has happen to their loves ones ; there then remains a lot to console those very disturb family members . The TRRC is all about the Truth, Reconciliation and Reparations; there should run parallel programs to console and preach reconciliation in our television stations and radios as well as in the pages of our newspapers so as to get the reconciliation at the end. It is very painful for love ones to be hearing what is done to their loves ones by people some of who are within us, and if not physically within us but we do live with their family members as well. It is also very important that we have people to confess voluntarily rather than, them be forced to do so. We want to applaud the confessions of one Bubucar Bah who confessed torturing OJ. We need more of such confessions so that they can be forgiven and there and only then we can have a true reconciliation. The Daily News is your news, entertainment, updates website. We provide you with the latest breaking news and videos straight from the media industry.